Where are you from originally? What was your background like? I was born and raised in Westchester County, New York in a town called Rye. It was a conservative town with not much to do there. I was a very lonely and bored child so I spent most of my days drawing to pass the time and to amuse myself. I also drew because it was the only way I knew how to express myself and something inside me just felt the need to. I know most artists have had mentors and influential people and/or other artists in their lives to nurture and inspire their talent, but I grew up in a very unartistic household. My father was a police lieutenant and my mother was an administrative assistant and they knew nothing about the arts. I don't think I even stepped foot into an art museum until I was eighteen years old. The School of Visual Arts in New York City. Where can I contact you for original art? Yes, but only if I'm allowed complete artistic freedom because I think a painting comes out better if it comes from the heart and what the artist choses to paint rather than being told what to paint. Why haven't you been able to paint or draw in the past several years? Can you try to paint with your other hand, or even feet? When are you going to get better and return to your art? How do you think your painting and drawing style developed? I had been accentuating and distorting things for as long as I could remember, it came very naturally to me. For example, one day in my high school art class when we were assigned to paint a still life from a display of bottles, I thought the bottles looked boring so I melted them all with my imagination and painted them that way... I guess I just always wanted to put more into whatever I saw in front of me. My style comes from my desire to transform my emotions into tangible planes that express what I feel, not what I see. I am also very bored with the ordinary and I love to create things I've never seen before. As for the elongated, stretched figures I create, they are a result of how I feel physically inside from my Ehlers Danlos Syndrome since we are very hypermobile, stretchy natural contortionists from the condition. How long do your paintings take? You began to exhibit your oil paintings in 2004. How did you get started? After I graduated college, I painted with whatever little time I had left over from my job as an illustrator to keep my sanity. A friend saw my paintings and told me that I should send my work to Juxtapoz magazine. I was so busy I never even knew about Juxtapoz magazine or about the whole exciting art scene that was emerging on the West Coast. I then sent my work to Juxtapoz and their editor Jamie O’Shea was so impressed with my work that he wrote a full feature on me and even put my painting "The Hunter" on the cover. Soon afterwards, Kirsten Anderson from Seattle’s Roq La Rue Gallery immediately gave me my first solo show and my career soon exploded afterwards. I was so grateful for my overnight success but I have to say it was insanely stressful trying to keep up with the immense workload, especially with my worsening health conditions from my Ehlers Danlos syndrome. I create mostly from the need to express myself, not much out of inspiration. Once in a while I will be inspired by a great movie or someone's life story. I'm mostly inspired by music though; I like the Cure, Queen, Depeche Mode, the Smiths, Siouxsie and the Banshees, Blondie, Joy Division, etc. I love music of all genres though. Music is my greatest passion. I have an unusual neurological condition called "synethesia", which means that I can see music inside of my head, so a lot of my work comes from the visions I see when I listen to music. I didn't know I was a synesthete until much later on in life when I was diagnosed with it. I thought everyone saw music as visual landscapes, so to speak. I also have spatial sequence synesthesia which means I can see time as well. It has definitely been an asset to my creativity! Can you explain the process of what goes into producing a final painting? It is a VERY long process, that's why my paintings take me so long to create. After I think of an idea, I make a sketch to figure out the best composition. I then have to choose a model that I think will best fit the mood of the painting, find a costume for the model and figure out the lighting for the photo shoot to set the mood and atmosphere of the painting. After that, I photograph the model myself so I will have a photo to paint/draw from for reference. After the photo shoot, I make a final line-drawing from my photo and transfer that drawing onto my board and paint about 5 to 6 under-paintings, building up the paint from dark to light to create depth. My elaborate frames are also almost all hand-painted with color accents to match each painting. Lori Earley at her easel in 2009 painting her comissioned piece titled, "Portrait of Ms. Ciccone" Oil on board ©Lori Earley. What materials do you use to produce your work? I work in oils and paint on either wood panel or ultra-smooth imported Italian linen. 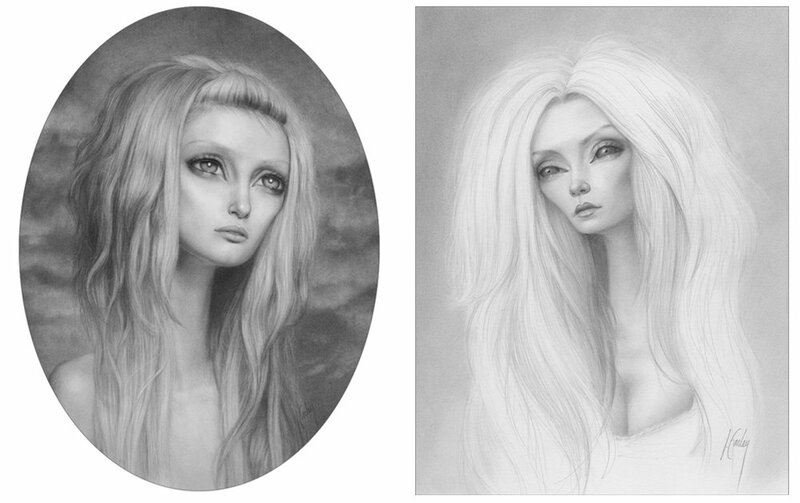 My rendered drawings are made with graphite on smooth bristol board paper. Did you ever find the two drawings that were stolen from your Fade to Gray solo show? Yes, I would be honored and flattered! If you can, please send me a photo of it when it’s done, I love seeing tattoos of my work and have a collection of photos from fans who got tattoos of my work throughout the years. I absolutely love it!